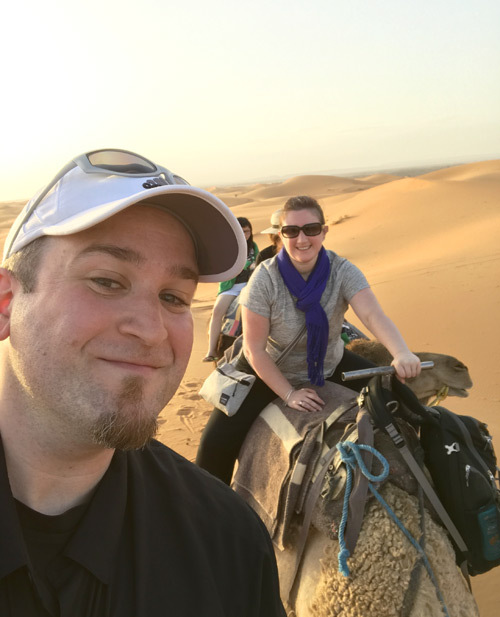 Riding a camel across the desert is an item on plenty of people’s bucket lists, and for years it sat toward the top of mine. When we decided to visit Morocco I was thrilled that my dream was going to become a reality—there was something magical about the idea of going completely off the grid and really immersing ourselves in a new experience. 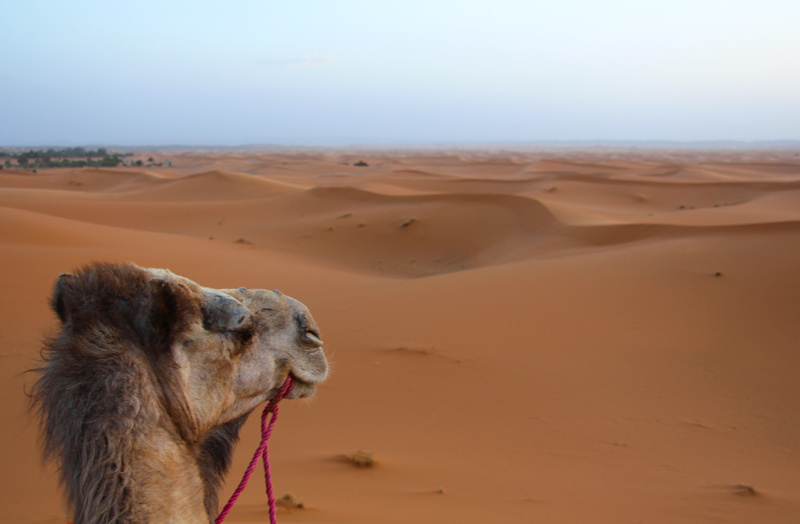 As we planned our Moroccan adventure to include a camel ride and a night at a Berber camp, I could picture exactly how it would go: I would sit perched high atop my borrowed dromedary as it gracefully scaled vast sand dunes. The hot wind would blow my hair behind me as I admired the vast golden landscape surrounding me. From there, my daydream would fast forward to laying in the dark beneath the stars, considering the fact I am but a small speck in a very big universe as I succumbed to a deep, peaceful sleep. The experience would be perfect. Once we arrived in Morocco, even as I enjoyed Marrakech and the kasbahs, I counted the hours until my desert dream would come true. 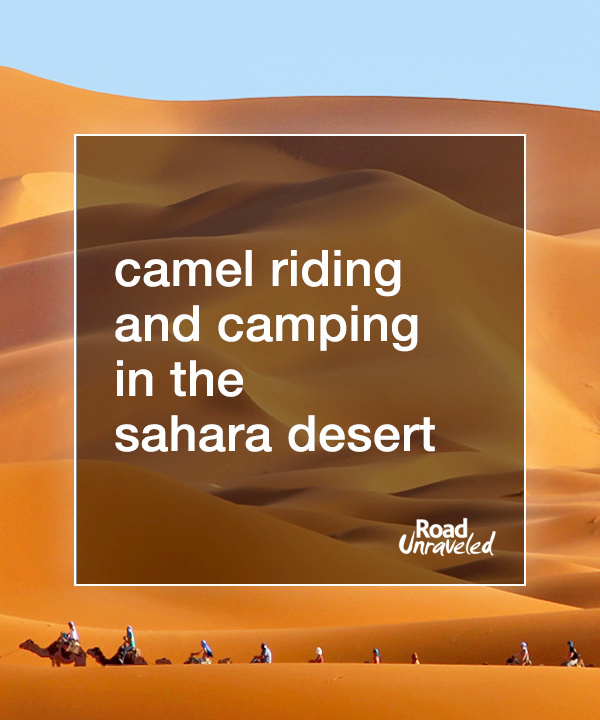 Did camel trekking and desert camping live up to the high standards I created in my mind? It actually did, but not in the romanticized way I envisioned. It was an incredible experience. If this kind of adventure is something you have considered, here are some of the do’s and don’ts we noted as our journey unfolded. 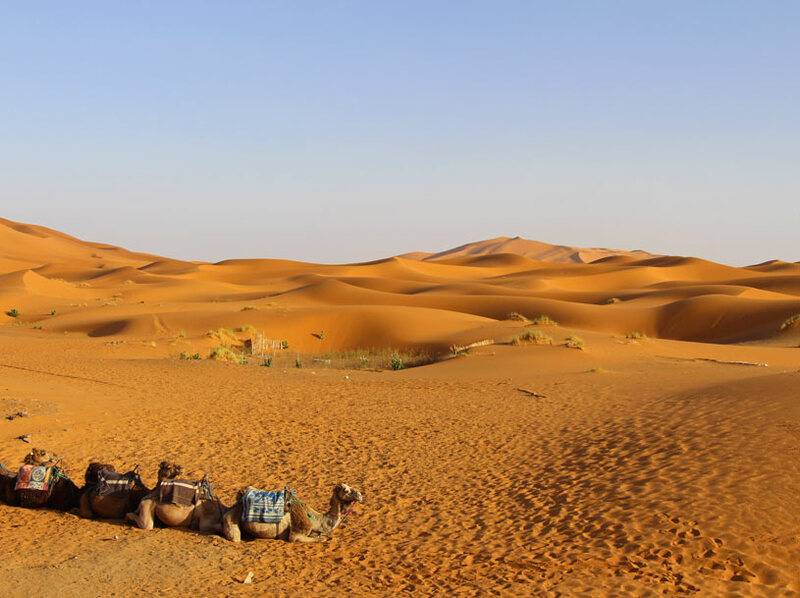 Our itinerary centered around an overnight camping experience in the Sahara Desert, bookended by camel rides that would take us to and from our overnight accommodations. Our starting point was a kasbah situated at the edge of the desert, and we had about 90 minutes to relax before our departure. We used most of our time to unwind from a long day of driving and exploring, and I am glad we did. It gave us both a much needed chance to decompress, process all of the incredible things we had seen, and prepare to fully embrace our next experience. I took a shower since we wouldn’t have access to one in the desert, so I felt refreshed when the time came to leave for our camp. 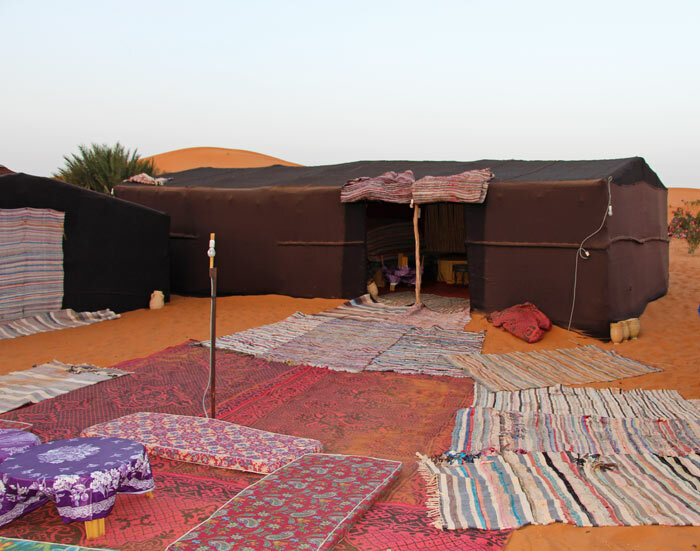 When we arrived in Merzouga, we had access to a private room in the kasbah where we would leave our excess luggage for the night. Adam and I each took a backpack with us and left our suitcases behind, as suitcases of any kind are much too big and bulky to make the journey. I only took a sweatshirt, a scarf, water, my phone, and a portable battery pack to charge the phone; I opted to sleep in the clothes I wore out, which meant a t-shirt and baggy harem pants. Adam brought his camera and some shorts to wear at bedtime. We were tempted to add other items to our backpacks (what if we wanted headphones for music? Would we want flip flops once we got to camp? ), but we resisted temptation and were ultimately glad we did. The camping experience passes by quickly—we were glad to only carry the basics. 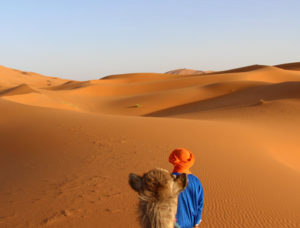 When it comes to camel rides, most journeys take between one and two hours depending on the location of the camp, so wearing the right clothing is a big part of how comfortable the trip will be. Here are a few tips to keep in mind. Adam wore sneakers, and I wore sandals with Velcro straps that fit snugly on my foot. Your legs will dangle when you’re on the camel (don’t expect stirrups like you might find on a horse! ), and flip flops or loose-fitting shoes are very likely to fall off. 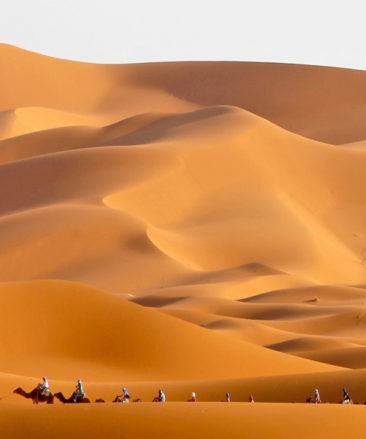 Your legs will come in contact with the camel and could chafe from the friction, so shorts won’t be the best choice. Tight pants, including jeans, may be uncomfortable and limit your movement when mounting or dismounting your camel. A loose-fitting t-shirt and some sunscreen is a good alternative. On our way to the camp we enjoyed some nice, calm weather, but on the way back to the kasbah the next morning it was much windier, and we were glad to have a layer to protect our faces so we didn’t have to breathe in sand. It should go without saying, but sun glare happens in the desert! This was easily my biggest mistake, and although I think it’s hilarious now, I was not laughing during our trek to our camp. Adam looks amused as I struggled to remain upright. We had a talk about this once I regained feeling in my arms. When our departure time arrived, our camel guide helped each of us on to the huge animals that would chauffer us to our destination. 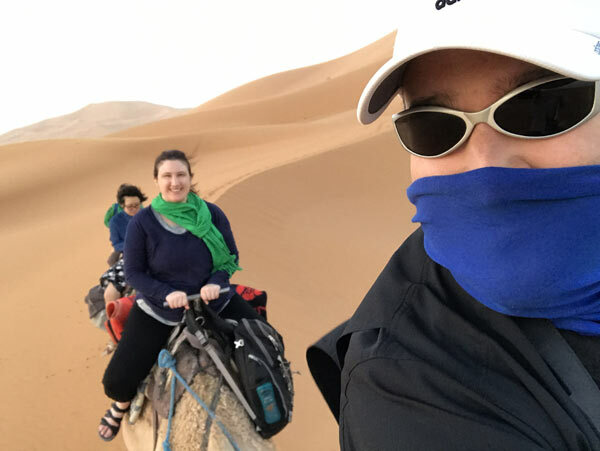 I nicknamed mine the Sand Rover and spent a few moments patting his head as my guide helped two fellow travelers onto their camels and secured my backpack to my camel’s harness. Then, my guide directed me to swing my leg behind the hump to climb on the camel’s back. That was the easy part. The hard part seemed to be finding a way to hold on so I wouldn’t lose my balance. The camel’s harness had a metal bar resting by his neck that I could barely touch; I’m not tall, so my reach is perhaps more limited than the average camel trekker. “Can I sit closer to the bar?” I asked, shifting so I could slide to the front of the hump. “Behind the hump,” my guide said. I frowned but rationalized that it might be bad for the camel’s back to sit to the front of the hump, so I stayed put. The guide stepped forward and coaxed the camel from a kneeling to a standing position. 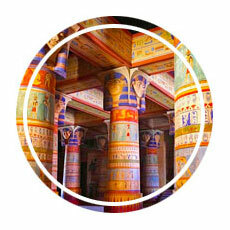 As the camel lumbered to his feet, I gasped and lunged forward to steady myself. “You’re OK,” the guide said. I wondered if that was a question, but it seemed to be a statement instead since he was already helping to secure Adam’s backpack to his camel. I shifted a bit, trying to will my arms to grow a bit longer. They stubbornly remained at their insufficient length. Once Adam was situated and his camel was on all four feet, it was time to begin our trek. I was somewhat content for the first five minutes. Then we reached the first of the sand dunes. 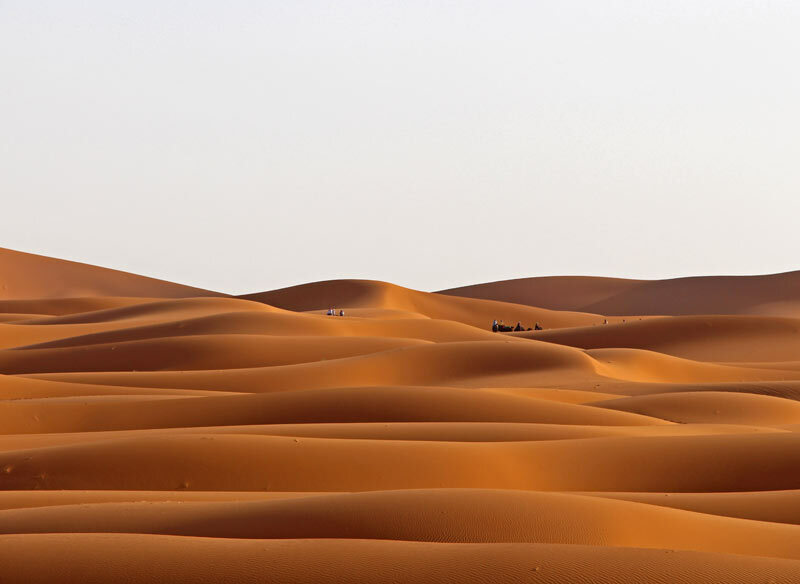 As the camels started to scale the dunes, I started to slide backwards to the point where I was dangerously close to slipping off completely. My arms clung to the metal bar, and I pressed my legs against Sand Rover’s sides to stop the slide. Sand Rover grunted in response. When we reached the top of the dune, we started our descent; after all, what goes up must come down. This time, my body weight pressed through my arms and into my wrists as Sand Rover’s jerky steps jostled me from left to right. I held onto the bar as tightly as I could, effectively freezing in a plank position, until we found flatter ground. That brief respite lasted for a few glorious seconds until the whole thing started again. For more than an hour I alternated between squeezing my legs as close to Sand Rover’s body as possible to avoid sliding off and hanging on for dear life in a horribly painful plank. My arms throbbed and my legs ached with each step. 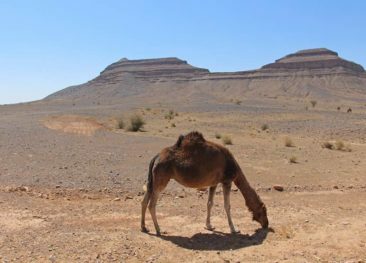 By the time our group arrived at our camp and Sand Rover knelt down so I could crawl off his back, I was so weak I couldn’t imagine putting myself through another trek in the morning. To fast forward a bit, the next morning—before daybreak—we boarded our camels to return to the kasbah. I slid onto Sand Rover, behind the hump, and exaggeratedly lunged toward the metal bar. “I can’t reach the bar very well,” I told the camel guide. 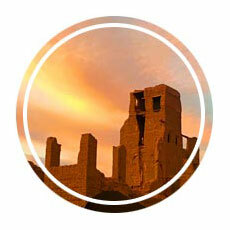 “What do I do?” The guide looked at me, stretched as long as I could get, and shrugged. “Sit in front of the hump,” he said. Somewhat stunned at how easy that was, I shifted myself over the hump. “Better!” I told him. And then I wanted to kick myself—instead of suffering all the way to camp, I could have just made a bigger deal about my needs so my guide could have known he needed to accommodate them. I would have saved myself a lot of discomfort if I had been more assertive. Underneath me, I am pretty sure Sand Rover was rolling his eyes. 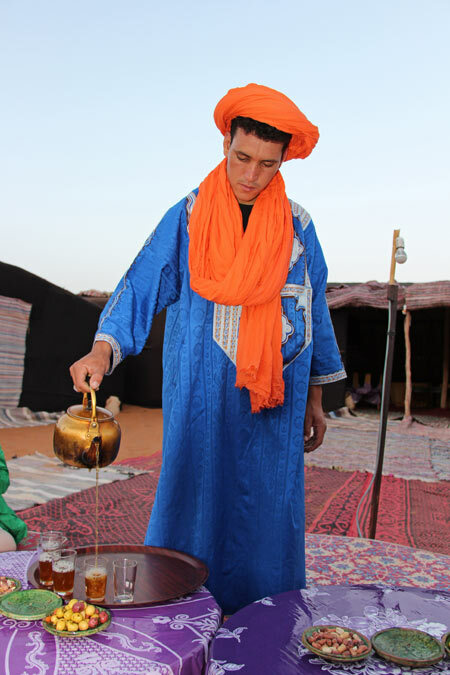 Although we were served a very delicious tagine dinner and plenty of mint tea at the camp, water was not provided. Adam and I had three bottles between us, and I still wanted more. 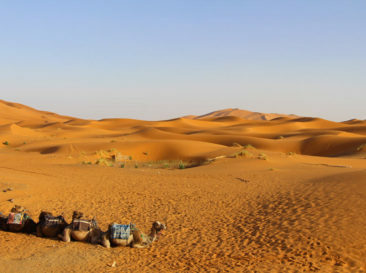 Don’t underestimate just how dry the desert is—an hour long camel ride can absolutely dehydrate you! 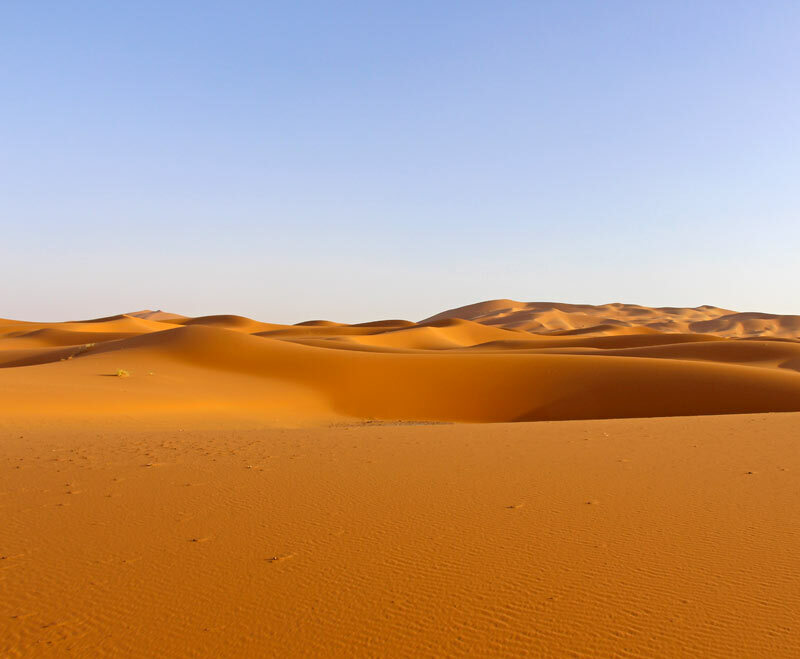 This is the Sahara Desert—it’s not a hotel—so be realistic when it comes to where you will be spending your night in the desert. Our camp consisted of several tents in a U-shape around a large common area. The tents were very basic, although they included clean mattresses (some with two single mattresses, some with one double mattress) and they did have electricity—no outlets to charge phones, but there was a light to make it easier to see when the sun went down. 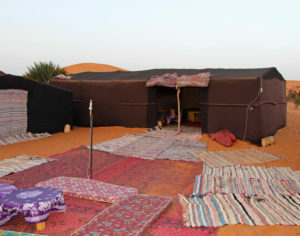 The common space had thinner mattresses situated around a table where we were served Moroccan mint tea after we arrived. We were encouraged to sleep there if we wanted to see the stars—and it was cooler to sleep outside than inside the tents. Another large tent housed a few tables with chairs, and dinner was served there. I was also pleasantly surprised to find we had a working flush toilet available to us. I hadn’t thought much about the restroom situation, but I was very excited that we had access to a modern convenience in the desert! Overall, we thought our camp was comfortable while being both modern primitive in all the right ways. 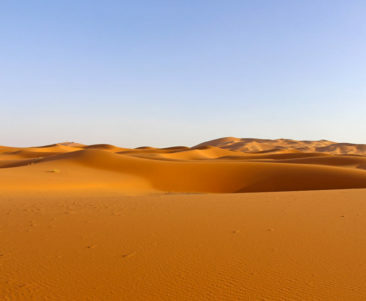 Keep in mind this is the desert, though, so expect sand to wind up everywhere—in the bed, in your backpacks, in your shoes, and in my case even my ears at one point. Also, the sand is warm when you arrive but quickly cools off, so know that your feet will be chilly if you walk barefoot in the morning! When we arrived at camp, the sun was already starting to set. Our guide made and then served us a delicious meal, and Adam and I had a great time chatting with the other travelers in our group—two fun, smart students from China studying in the UK. It was after 10:00 PM when our camel guide told us he would wake us up around 4:30 the next morning, so everyone decided to get some sleep. I joined Adam in our camp for about ten minutes but found it much too warm to rest, so I moved outside and lay down on some of the mats our guide had placed in the sand. In the Sahara, far away from light sources that pollute the night sky, the stars shine brighter than I could have imagined. They twinkle, they pulsate, and they practically dance across a pitch-black canvas. I lay on my mat, mesmerized. I couldn’t take my eyes off the sky. My mind wandered to just how very small my role is on the planet, to how many people had come before me and how many would come after me. I contemplated my problems, my decisions, and my blessings. 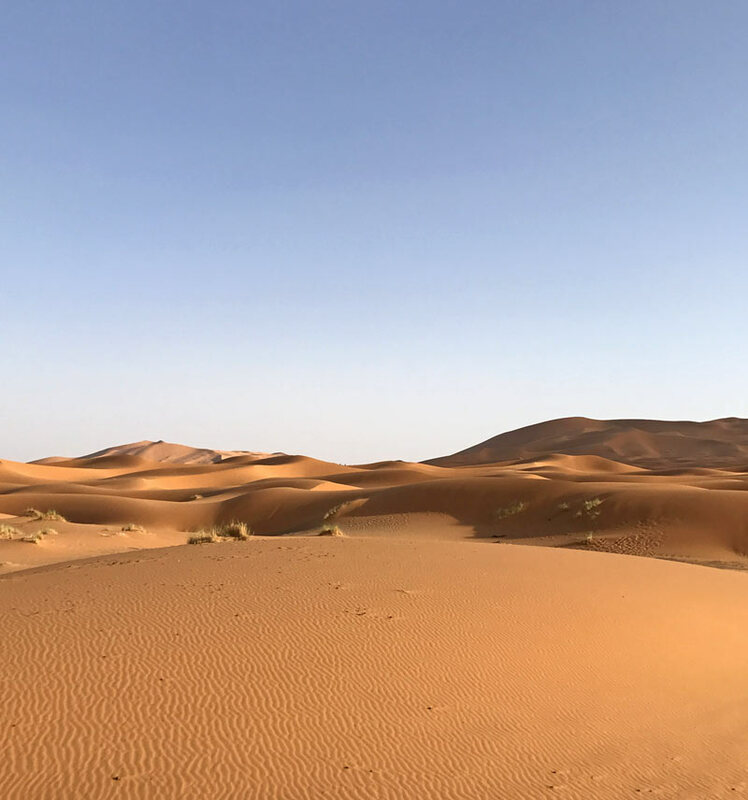 I felt grateful to be right there, in Morocco, in a moment that exceeded what I had dreamed a night in the desert could be. I checked my phone. It was 2:36 AM. 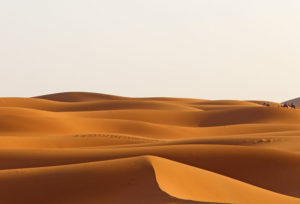 It occurred to me then that I couldn’t claim I had slept under the stars in the Sahara Desert if I didn’t actually sleep. The balance of my night was spent dozing off for a few minutes at a time until shortly before 4:30, when I crawled back into the tent where Adam was just starting to wake up. He had spent the night tossing and turning in the heat, so we were both exhausted but happy to have had the experience. 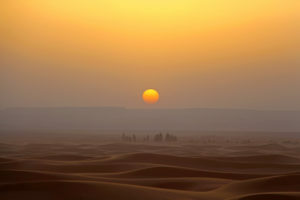 Getting some sleep during a desert camping experience is advisable, but don’t go to bed too early. Don’t miss the silence, the twinkling stars, or the tranquility that can only come from a night spent far from distraction. 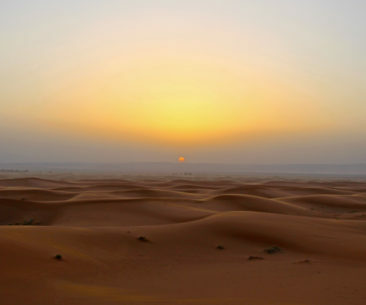 Sunrise over the Sahara. Bucket list item checked! 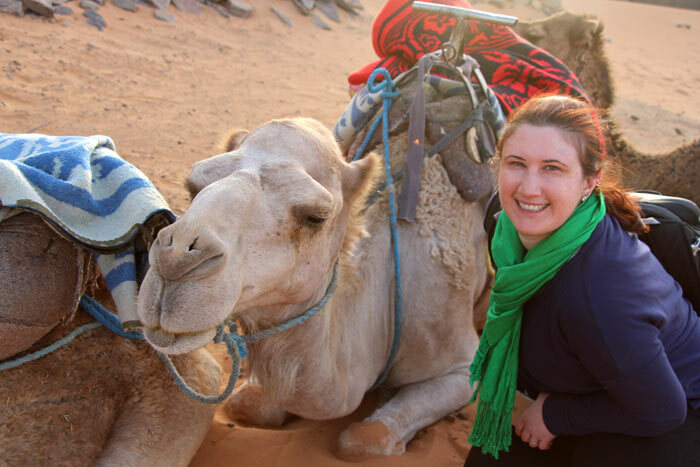 Assuming you aren’t clinging to your dromedary for dear life, there is a lot to enjoy when it comes to camel riding. The sun makes the sand look like it glows from within; for most of our ride we were completely surrounded by rolling waves of golden sand. We passed cactus and palm trees, and we noticed how from certain angles we would have sworn there were huge lakes of water—in reality, they were just mirages. We woke up and left camp early because we wanted to see the sunrise, and we were not disappointed. 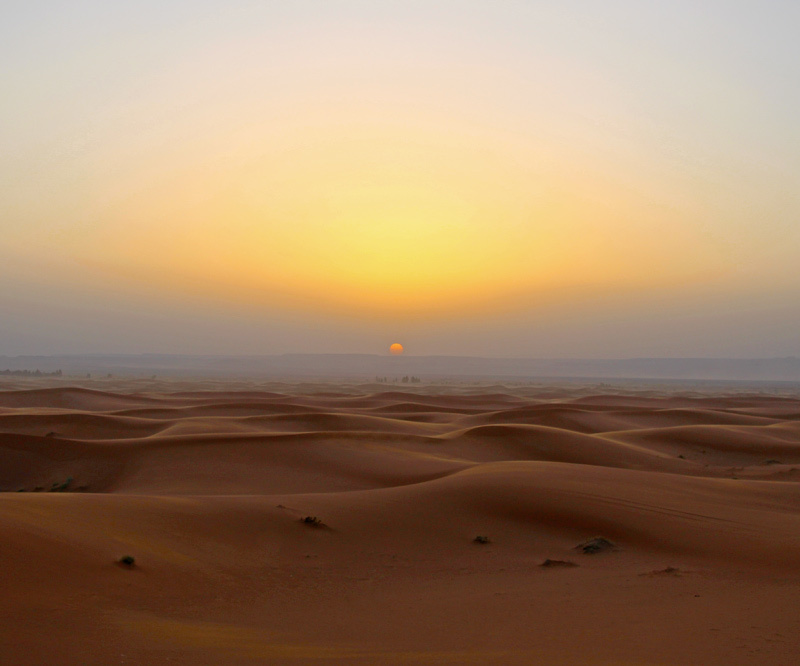 Just as the sun peeked over the horizon, our camel caravan paused at the top of a high dune. We had front row seats to watch as the sky changed from light blue to pink to bright blue and the golden orb floated higher and higher overhead. Adam took dozens of photos while we stood still, but I left my phone alone and focused on just watching the changing sky. Not long after the sun was clearly above the dunes, as I considered how incredible the moment was, Sand Rover yawned and rotated himself away from the sunrise. The camel just behind me loudly belched in my direction. I laughed; maybe no moment is that perfect. Because my ride back was much more comfortable (and I was sitting completely upright—not stretched out over the hump!) I was much more connected to the view, the scenery, and the experience. It was truly unforgettable. I hadn’t thought much about what the ride might be like before our trip to the desert, so I was taken by surprise when it was really bumpy! Even thought the sand looks smooth, camels themselves have pretty jerky movements as they scale the dunes. Keeping in mind that they are trying to maintain balance under a shifting surface while walking up and down steep hills, it makes sense. This is why it is very important to make sure you are comfortable before your departure, but it’s also important to know even if you are well positioned on your camel’s back. Prepare to shift your own weight to find your balance as the camel does the same. I found that, by the time our kasbah came into view on our way back from the camp, Sand Rover and I had found a good rhythm where I understood his movements… and he was making fewer frustrated sounding grunts. 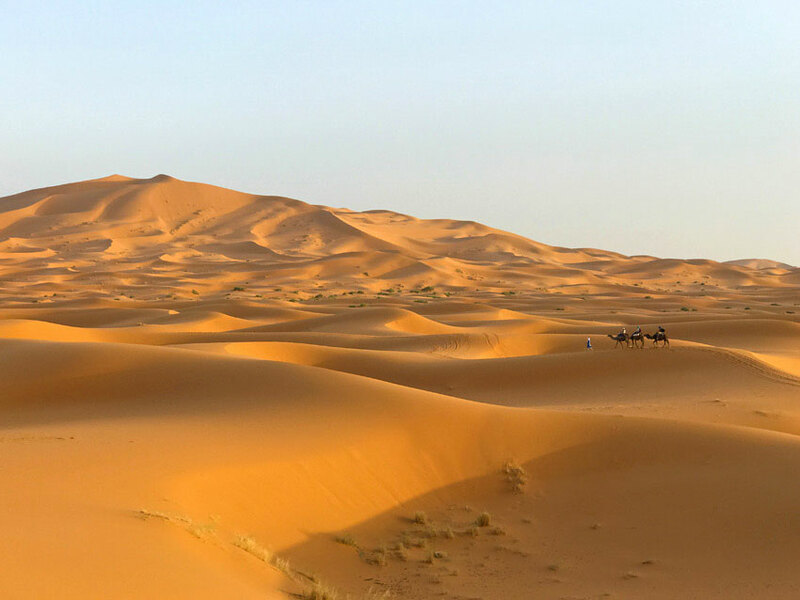 There were moments during my camel riding experience when I caught myself considering that I could stop the pain by just falling off Sand Rover’s back and landing in the golden dunes below us. 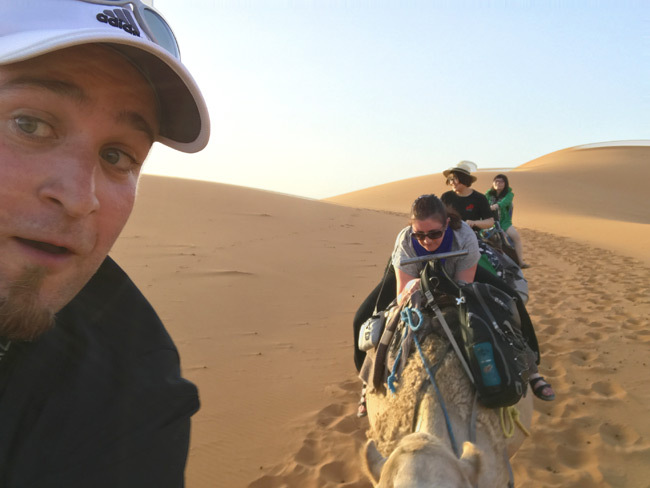 The image of me falling to the ground made me chuckle, but the truth is camel riding can lead to injury—even severe injury—if an accident happens. Coupled with the fact Merzouga is in a pretty remote part of the country, I was happy we had a good travel insurance policy in case we needed emergency help. 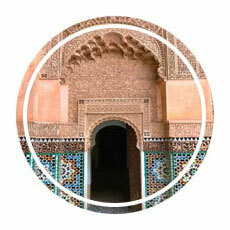 We purchased a plan from World Nomads before leaving for Morocco. It’s a great idea to research your options and pick the right plan for you. This one should go without saying, but I had a great deal of admiration for our camel guide. 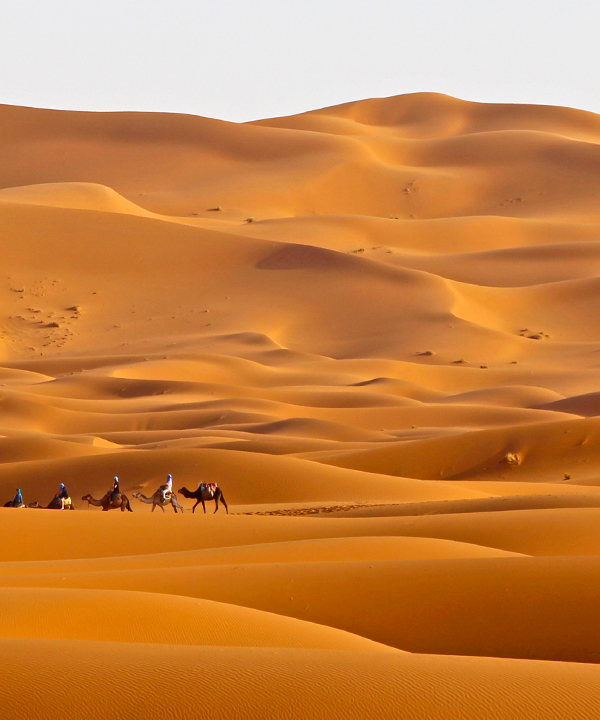 He made the same journey we did, but instead of riding through the sand he had to walk up and down the dunes. Anyone who has spent time on a beach knows this isn’t the easiest physical feat! 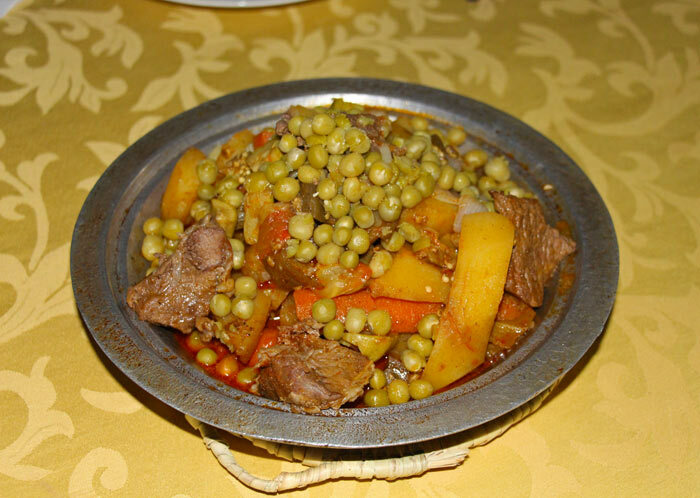 Our guide paused our trek once in each direction to offer to take photos of us on the camels in the desert, and he and another guide cooked a delicious meal for us for our dinner. They went to bed after us and woke up before us. We were really pleased with the service we received, and we both agreed we wanted to offer a tip. If you, too, have a great experience, don’t forget to pack Dirham in your overnight bag to offer to your guide when your trek is over. 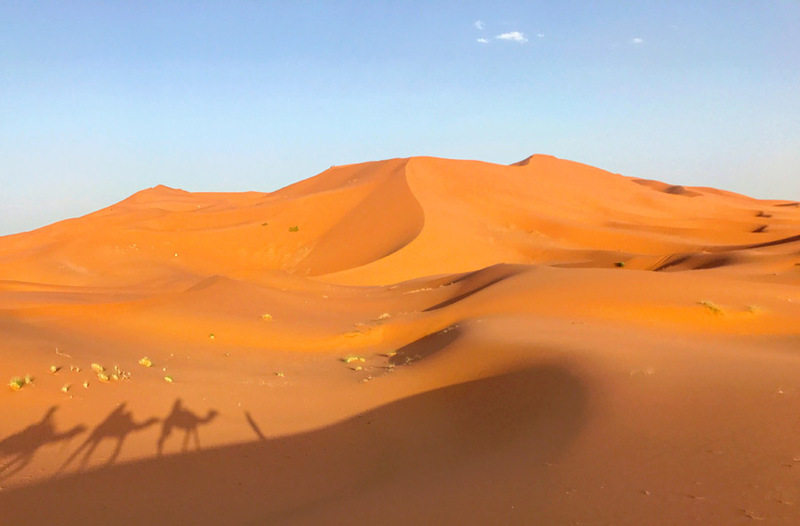 Thinking back to my camel riding and Sahara camping experience, I have to admit that my idealized daydream didn’t completely come true. If I were to do it all again, I would probably enjoy it much more thanks to lessons learned from this experience. Even with the bumps, the discomfort, and the mostly sleepless night, it was a real highlight from our trip to Morocco. If the Sahara Desert beckons you, too, keep these do’s and don’ts in mind—and be sure to savor every second of laying under the expansive sky under billions of shining, twinkling lights. Here are even more photos that captured our experience!